Zinc One Announces Additional High-Grade Zinc Results from Bongarita Zone at the Bongara Mine Project, Peru | Energy and Gold Ltd.
Vancouver, British Columbia–(Newsfile Corp. – April 11, 2018) – Zinc One Resources Inc. (TSXV: Z) (OTC Pink: ZZZOF) (FSE: RH33) (“Zinc One” or the “Company”) announces the final drill results from the Bongarita mineralized zone subsequent to the results previously reported (see news release from March 29, 2018). The Bongarita zone is one of several high-grade mineralized areas being targeted in the ongoing drill program at the Company’s Bongará Zinc Mine project located in north-central Peru. A total of 36 holes for 587.2 metres were drilled at Bongarita. Very fine-grained zinc mineralization, mostly as silicates exclusively hosted by soils, has been delineated over an area of approximately 7,500 square metres. 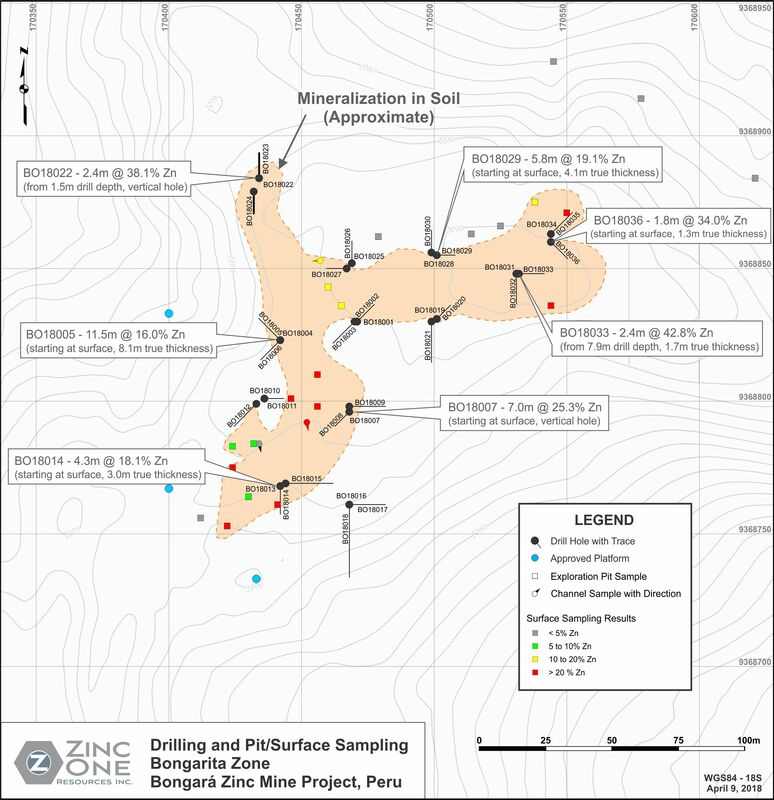 Bongarita is only one of the three known zones, which includes Mina Chica and Mina Grande Sur, of high-grade, near-surface, zinc-oxide mineralization along a 1.6 kilometre mineralized trend that is being tested. Two portable rigs continue to drill at Mina Chica and Mina Grande Sur. At Mina Chica, which lies approximately 200 metres east of Bongarita, results from 6 of the 41 holes drilled have been reported. At Mina Grande Sur, which is approximately 1.2 kilometres southeast of Bongarita, results from 11 of 60 holes drilled there have been reported at this time. Results reported to date are from zinc oxides, carbonates, and silicates hosted by soils, highly-weathered carbonates, and dolomites in those areas. The zinc mineralization is nearly delineated- it is open eastward in the NE sector where BO18033 and BO18036 had 1-2 metre intercepts of30% zinc. Significant results, including the drill hole orientation and total depths for Bongarita, can be found in Table 1. In addition, a map (see Figure 1.) shows the area of mineralization and the drill hole program at Bongarita. A link to additional maps outlining a more detailed and technical view of the area is also provided. The zinc mineralization at Bongará is hosted by carbonate rocks and is classified as a Mississippi Valley-type deposit. The mineralization is stratabound and is basically a tabular body with irregular boundaries. Hydrozincite, smithsonite, hemimorphite, and a zinc-aluminum-iron silicate are the primary zinc minerals that are hosted by soils, heavily-weathered fractured and vuggy dolomites, and fine- to coarse-grained dolomites. At Bongarita, zinc silicates dominate and they are hosted exclusively by soils. The sample from each core run is placed in a 60-centimetre long, plastic core box that has five columns. Core recovery, rock quality designation (“RQD”), and geologic features are logged and sample intervals, which are generally <2 metres, are chosen. Each core box is photographed and then sampled with a spatula (soil and heavily-weathered rock) or cut with a core saw, 50% of which is placed in a sample bag and stored on site in a secure location. The Company independently inserts certified control standards, blanks, and duplicates, all of which comprise at least 20% of the sample batch, to monitor sample preparation and analytical quality. The samples are stored in a secure area until such time they are shipped to ALS laboratory in Lima (ISO 9001 Certified) for preparation and assay. At the laboratory, samples are dried, crushed, pulverized and then a four-acid digestion is applied. This is followed by the ICP-AES analytical technique for 33 elements, including lead. The same method is used to assay zinc for values up to 20%. If zinc exceeds 20%, it is then analyzed using a titration method. The laboratory also inserts blanks and standards as well as including duplicate analyses. The technical content of this news release has been reviewed, verified and approved by Dr. Bill Williams, COO and Director of Zinc One, a qualified person as defined by National Instrument 43-101. Zinc One is focused on the exploration and development of prospective and advanced zinc projects in mining-friendly jurisdictions. The Company’s key assets are the Bongará Zinc Mine Project and the Charlotte Bongará Zinc Project in north-central Peru. The Bongará Zinc Mine Project was in production from 2007 to 2008, but was closed due to the global financial crisis and concurrent decrease in the zinc price. Past production included 20% zinc grades and recoveries over 90% from surface and near-surface zinc-oxide mineralization. High-grade, zinc-oxide mineralization is known to outcrop between the mined area and the Charlotte Bongará Project, which is nearly six kilometres to the NNW and where past drilling intercepted various near-surface zones with high-grade zinc. Zinc One is managed by a proven team of geologists and engineers who have previously constructed and operated successful mining operations.